Yes, it’s a $5 view, at least the foul pole isn’t in the way. Cheap Seats at Great American Ball Park, Tip #1) Outer View. You can’t beat the price of the Outer View seats in Section 509 in left field…they can often be had for just $5. And you can order them online rather than having to go to the box office, although you’ll pay the online fees. Sure, the view of the action isn’t great, although the view of the Ohio River and Kentucky is pretty boffo. But for most games, you can usually move to a better spot in the 500 level after the third inning or so. I’ve done this…please don’t tell the Reds. Since the soon to be discussed “District Ticket” includes a free drink, it’s about the same deal as just buying a $5 ticket and hanging out in the District, where anyone with a ticket can go. Except you have an actual seat for just a finski. Cheap Seats at Great American Ball Park, Tip #2) Bleachers. 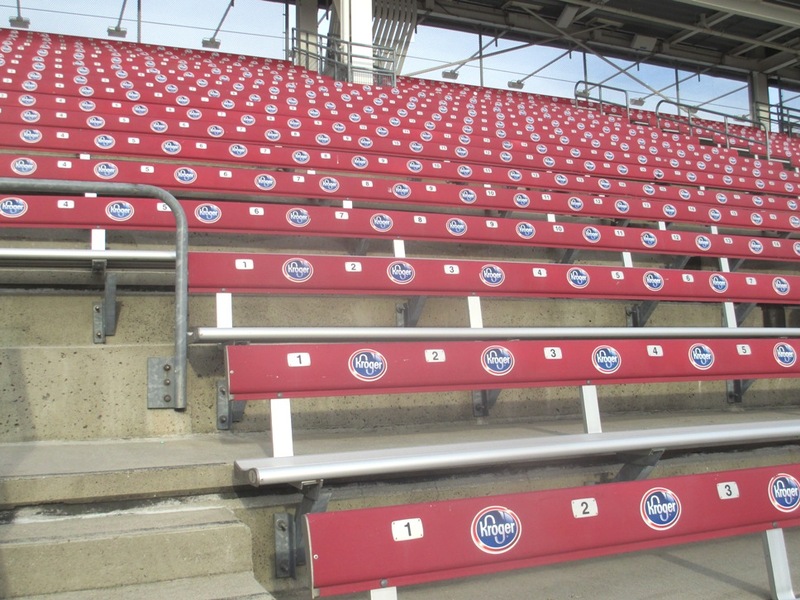 The Kroger Bleachers are the sections directly underneath the scoreboard; they are metal benches with backs and are the cheapest seats in the ballpark, save for Outer View seats and standing room. The first 3-6 rows of the bleachers (Rows A-F) are downstairs from the entrance to the seating area; they cost the same but are closer to the action. There is a walkway separating these from the rows behind them, which makes going for a hot dog much easier from Rows A-F. The bleachers also in front of the impressive Big Board, but for your hi-def information there’s a nice new scoreboard in right field. One important thing…the bleachers get hot. This is the last place to see shade for a night game, and their being metal doesn’t help. It’s a good idea to bring a hat and sunglasses. That’s not to say it’s a bad deal; bleachers are affordable and attract a fair number of families. It’s a little more raucous out there, which can be fun. It’s not like you’re that far behind people that paid $6 more. And you have shade! 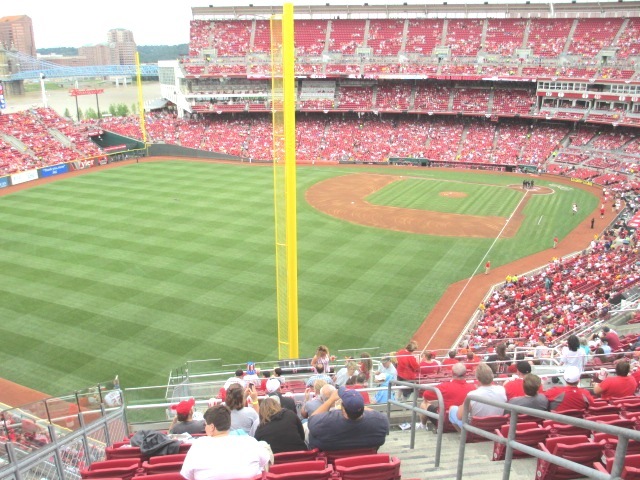 Cheap Seats at Great American Ball Park, Tip #3) Upper View Level. If you don’t mind sitting in the highest rows of the upper deck…and behind home plate this isn’t usually a bad thing…the top seven rows or so of the 500 sections go for a pretty nice price…often even less than the bleacher seats. Not bad for actual seats that aren’t hard hot metal, but probably not for the acrophobic. It’s another way to get into the ballpark cheap, and with seats that aren’t half bad with a nice view of Kentucky and the bridges going across the Ohio. Again, in my experience, the upper level here isn’t tightly patrolled, and in the 500 sections you can usually move to a better spot. Featuring seating deftly arranged to encourage fans to guess where the field is! Cheap Seats at Great American Ball Park, Bonus Tip!) The Fioptics District. If you’re not quite into baseball enough to just sit in a seat for nine innings and would like to socialize a bit (and I’m not judging), the Fioptics District is ideal for you. 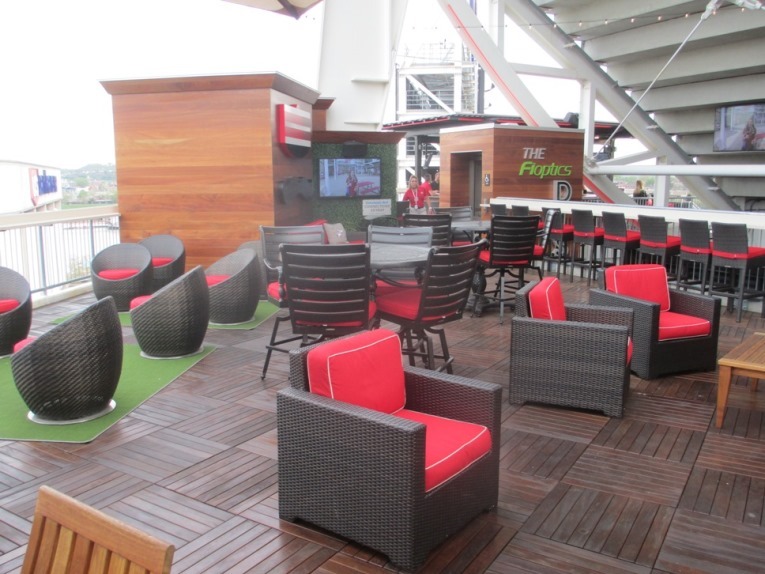 The District is a lounge area with a full bar, comfy sofa-style seats with a fine view of downtown Cincinnati, and tables and drink rails with a view of the ballgame from left field. 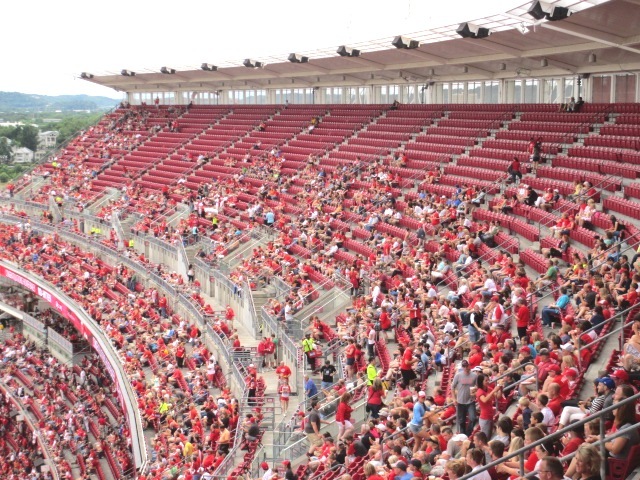 These used to be 400 level seats, but too many of them had the foul pole in the way, so the Reds turned it into a standing area. 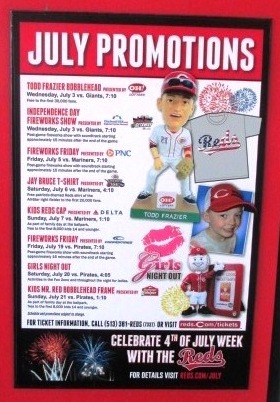 The best part is that the Reds sell a very inexpensive “District Ticket” that includes added value for a drink or a concessions item, and you can use this credit in the nearby Machine Room restaurant. Great for a nice cheap evening of baseball. There’s a few choices for the cheap seats at Great American…I checked for a low demand game, but these were all under $20 as I wrote this. But if you have a few extra bucks to spend, try these on for size.